FACT CHECK: Did Black Support For Trump Double In One Year? Conservative commentator Candace Owens claimed that black support for President Donald Trump has doubled over the last year. The latest polls have generally found that Trump’s standing in the black community has improved over the last year, but many do not show a doubling of support. Demographic polling tends to have a large margin of error and should be interpreted with caution. Owens appeared on MSNBC recently to discuss race relations in the country. The segment got heated after Georgetown professor Michael Eric Dyson accused Trump of “vicious animus” toward black people. “If we’re going to be honest about Donald Trump, he has not helped black people. He has not enabled African American people to move forward. He’s riding a crest and a wave of economic prosperity put in place by his predecessor Barack Obama,” he said. Owens, a black supporter of Trump, argued that the black community has responded favorably to Trump’s economic policies. “Black support for Donald Trump has doubled since this time last year,” she claimed during the Aug. 7 interview. This isn’t the first time a conservative pundit has suggested that black Americans are warming to Trump. Similar claims were made back in May after rapper Kanye West stirred controversy by sending out several pro-Trump tweets. “You don’t have to agree with trump but the mob can’t make me not love him. We are both dragon energy. He is my brother,” West tweeted. Polling by Reuters showed that Trump’s job approval rating among black men doubled that same week, rising from 11 percent to 22 percent. News outlets like The Washington Post pushed back on the idea that these polls represented a broader trend, saying that they only covered a week’s worth of data and applied to one part of the black community – black men. Owens’ claim is more broad, focusing on support over a longer timespan and the wider black community. Some pollsters conduct surveys weekly or even daily, while others do so less frequently. Here’s a summary of the results, compared to numbers from a year ago. The takeaway: some, but not most, polls showed a doubling of support. Rasmussen, which tracks Trump’s approval rating daily, made our job easier – they actually tweeted out the figures on Aug. 2. Rasmussen is not alone. Polling done by YouGov, in conjunction with The Economist, showed black support doubling from 7 percent to 16 percent year over year. The approval rating tripled, according to Quinnipiac, rising from 4 percent to 13 percent. The remaining polls we identified all showed some growth over the last year, but not a doubling of support. Fox News, for instance, found that support among blacks had risen from 8 percent to 12 percent, while Gallup reported a 13 percent approval rating compared to 9 percent a year ago. Rasmussen was indeed one of the most accurate pollsters heading into election night, although they accurately predicted that Trump would lose the popular vote, not that he would win the election. Owens is right, however, that skepticism is warranted when interpreting these polls. First of all, they disagree over how much support the president has among blacks, let alone how that support has changed over time. Rasmussen said that Trump enjoys a 29 percent job approval rating in the black community, while Fox News only placed the level of support at 12 percent. The most common approval rating among blacks was 13 percent. Much of the variability comes down to the way polls are conducted. There are a whole host of decisions pollsters have to make when surveying the public. Some survey by telephone, while others opt for online polls; some use robocalls, while others employ live interviewers; some focus on registered voters, while others sample from all U.S. adults; and so on. There’s also a considerable amount of uncertainty within the polls themselves. When approval ratings are broken down by race, the sample sizes become much smaller, which can lead to large margins of error. The Quinnipiac poll, for example, has a margin of error for black respondents of plus or minus 13 percent. So although the pollster found that black support grew from 4 percent to 13 percent over the last year, support could have also theoretically declined, or even jumped as high as 26 percent. Quinnipiac came out with a new poll after Owens made her claim showing that support had dropped to 9 percent. “The number of African Americans in these samples tends to be so few that these differences are essentially meaningless,” Costas Panagopoulos, director of big data and quantitative initiatives at Northeastern University, told TheDC. Case in point: the Economist/YouGov polls that come out weekly. We chose the week immediately prior to when Owens appeared on MSNBC to assess her claim, and the polling showed a doubling of support – 7 percent for the survey completed on Aug. 8, 2017 and 16 percent a year later on Aug. 7, 2018. But if that timeframe is shifted forward a week, the year over year change isn’t all that dramatic. Black support rose from 14 percent to 16 percent for the surveys completed on Aug. 15, 2017 and Aug. 14, 2018. 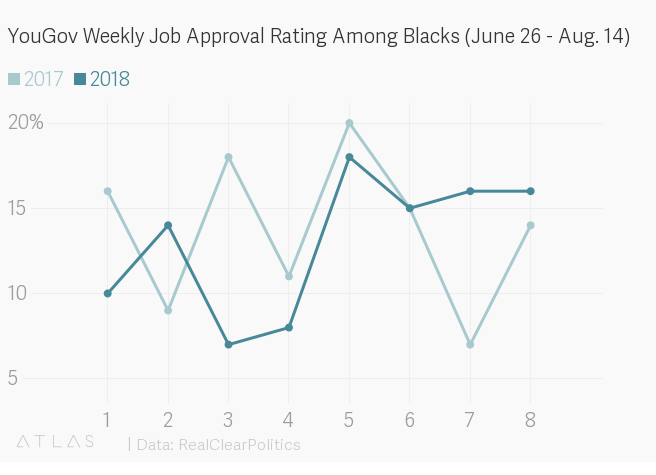 Support jumps all over the place, and in some weeks the results even show a year over year decline in support among blacks. Not all pollsters have found such a wide variation. 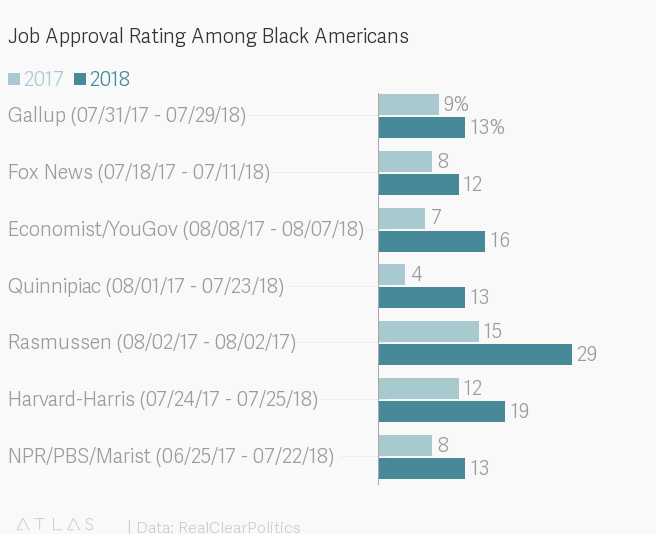 Approval ratings by Gallup show black support hovering somewhere between 8 percent and 13 percent over the last year. Essentially, there’s enough uncertainty within and between polls that Owens’ claim should be taken with a grain of salt.